PEGGY GLANVILLE HICKS TALK GIVEN BY SANDY EVANS ON NEW MUSIC. Sandy Evans is a well respected Jazz Musician of Sydney, whose deep interest and talents see her collaborate with the percussion master Guru Karaikudi Mani Iyer and perform with his team in India and Australia. Sandy’s recent inspiring talk at the Peggy Glanville-Hicks address raised the challenges faced by New age musicians today. “Most musicians I know play music in several different stylistic areas : jazz, contemporary classical, computer music, early music, free improvised, blues, Brazilian, funk, soul, Afro-Cuban, West African, Arabic, rock, Bulgarian, Celtic, gospel, country, hip hop, Hindustani, Japanese, Carnatic, the list goes on and on. You name it we do it! So when we write music, or create platforms for improvisation, it’s likely to be influenced by anything from the whole history of music on the planet. And yet, a jazz musician would be quite rightly annoyed if a contemporary classical musician presented themselves as a jazz musician and vice versa”. In so recapping she opened the door on the vast and wide sources that influences and inspires musicians of new age music to date. New music by its very nature is unique. Should it or can it be fitted into a box, defined and chiseled to conform? Or is it by its very newness indefinable and seamless with possibilities. Most think that New age music today is like an orphaned child that craves to find its true biological existence, but continues to call another its parent, find a true home that it can call its own but has another home in its adopted existence. This place is a very uncomfortable place for traditionalists of any type of music, Eastern or Western. Sandy profoundly says ” New music by its very nature embodies change and therefore brings about small deaths of old sounds.” However she further qualifies this “I have taken many breaths in my life, but I always gain something from turning my attention to breathing again. Each breath follows a similar passage through my body, but it’s never the same air that’s moving, or the same sound that it sets vibrating. Newness is inevitable. It regenerates. Research into the canary has even discovered that when an adult canary learns a new song it grows new brain cells in the upper parts of its brain.” However she continues to add “It is necessary to respect the integrity of different traditions and to protect their future evolution. At the same time, one of the most exciting things about being a musician today is participating in an unprecedented level of musical exchange across genres and cultures” A positive spell. Sandy Evans tours with Guru Karraikudi Mani Iyer performing in many cities in India and continues to learn from him. She talked about a composition that she wrote after a particularly tiring trip travelling on a bus in India. She said that the bus trip turned into a most inspiring tour however when Guru Karaikudi Mani Iyer engaged the musicians talking about the various experiences of his life. 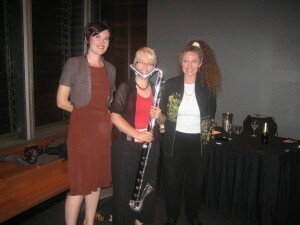 Sandy wish to share her love for Jazz with others sees her perform in schools in various remote parts of Australia. An interesting story she talked about was her work with two inspiring people Ruby Hunter and Archie Roach. “Ruby was forcibly removed from her family when she was eight years old. She grew up in foster homes and on the streets of Adelaide. She met her partner Archie Roach, also a member of the Stolen Generation, in Melbourne where they were homeless teenagers. Completely outside mainstream Australian society, Ruby and Archie rebuilt their lives through the love and care of each other and their shared love of music. Every time Archie performs his song Little by Little, I’m moved to tears.” She said. and nobody can say that this is mine but me. Aint nobody gonna tear this building down. Cause its built inside of me, where nobody else can see. Sandy Evans tours consistently and visits remote parts of Western Australia and the Northern Territory as part of MARA! for Musica Viva. She says they played for a number of aboriginal communities, sometimes performing adult concerts, sometimes performing for school children. They were not sure what to expect on their visit to a place called Kalumburu after being warned about serious problems in that community, one of it was arrests of a number of elders for paedophilia. Sandy says that they found to their profound surprise that about 100 kids of all ages had learnt all the tunes and words of all the songs they played in four different languages, Bulgarian, Irish Gaelic, English and Turkish. They had been taught by a dedicated Japanese Teacher”. Hear Hear any one can therefore learn a few traditional songs in Hindi, Marati, Telugu or any one of the Indian native languages with or without the Aussie slur ? In conclusion Sandy referred to Dr Roger Frampton one of the first jazz musicians in Sydney to introduce chance ideas and graphic scores into his compositions, to play electronic music, to play free music, to play prepared piano, to explore odd meters and metric modulations, to explore polytonality, to use serial techniques in his composition, to play the sopranino saxophone. The Talk concluded with a soulful rendition of Margery Smith on the Bass Clarinet with Rachael Brown who provided visual effects through electronic filming. The performance completed the evening and I left with sounds of the Bass Clarinet thinking how wonderful it would sound when mixed with the dronic sounds of a Tanpura. TONY GORMAN – A Clarinet player musician writes……….. “Once a man of many words, these days I like to keep things simpler. It’s more than a decade since I woke up one morning unable to walk properly. ‘Songs Of Hope’ was my response to my diagnosis with Multiple Sclerosis, not really knowing where my journey was leading. Having hit the depths of physical and mental distress at various times, I find I still have an irresistible urge to express myself through music. To paraphrase some Sufi philosophy – the artist paints what the poet cannot say, the musician plays what the artist cannot paint. On this phase of my journey I am joined by my dear friend Bobby Singh and my two Sruthi boxes. Bobby brings such grace and beauty to my vision. From the first time we played together it was like ‘hand-in-glove’. I’ve never had to say anything to him other than “Let’s Play”. An atmosphere, an expression greater than the sum of two instruments, is created and expanded upon, until it feels, to us at least, ‘As Large As Longing – As Wide As The Sky’. Much Love To You All Tony” Listen to Tony’s music at www.myspace.com/tonygorman. Tony Gorman talked to Sydhwaney after the show. A soulful experience with amazing rich textures Tony’s compositions were beautifully adapted by Bobby Singh on his Tabla. Tony talks about his very novel use of the Electronic Droning machine called the Shruti Box. Listen to Tony’s love for the Shruti Boxes which he says have helped him manage his Multiple Sclerosis too well. You will not see him go any where without his Shruti Boxes says Saxophonist Sandy Evans. Didgiridoo is just a hollow long structure of wood through which this amazing meditative and sonorous sound is produced to lull us into its depths. But children being what they are can produce any sound cant they ? Watch them here !! Fascinating and playful ! !